The project explores how migration and current immigration policies are impacting their lives, how satisfied they are with local services, the quality of their relationships, and their feelings of identity and belonging in the UK. The project is important because it presents the first analysis since the Brexit Referendum on how current plans for Britain to leave the European Union are impacting on young Eastern Europeansâ&#x20AC;&#x2122; lives. We have gathered the opinions and experiences of over 1,100 young people on a range of issues: their feelings of national and local belonging, their participation in communities, their access to services, their experiences of racism and exclusion, their experiences of education, their relationships, well-being and plans for future now that the UK is planning to leave the EU. These Briefings aim to inform a wide range of audiences on the experiences of young Eastern Europeans living in contemporary Britain. The Briefings should also help local authorities and other organisations develop policies and improve services for young people, taking into account their needs and experiences. Here to Stay? is a research project which explores the lives of young people who arrived in the UK as migrant children from Central and Eastern Europe (CEE). It focuses on young people aged 12-18 who migrated after the EU enlargement in 2004 and have lived in the UK for at least 3 years. Here to Stay? 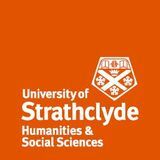 is a project carried out by researchers from the Universities of Strathclyde, Plymouth and Durham. The project is funded by the Economic and Social Research Council. We consulted Eastern European young people living across the UK, in urban and rural areas, using a range of research methods. We also work with a group of Young Advisors who give us their thoughts on how best to carry out the study. To get a UK-wide picture, we asked young Eastern Europeans (who had lived in the UK for 3+ years) to complete an online survey. This was advertised through schools, youth clubs and social media, and over 1100 young people took the survey. We then talked to 20 groups of young people in schools and youth clubs across Scotland and England. We asked them about their everyday lives, places they go to, things they do and canâ&#x20AC;&#x2122;t do, and how they feel about living in the UK. We also talked to people who work in organisations that engage with Eastern European young people living in the UK, such as schools, youth clubs and health centres. Our next step is to speak to some more young people and their families about their life in the UK to allow them to share their individual experiences in more depth. Findings in this Briefing are mainly based on the analysis of the survey data. More Briefings will be released as the research develops. Only 17% of the young people who reported on their voluntary/community work said they volunteered at least a few times every month. These rates of volunteering are lower than volunteering rates in the general youth population. An Ipsos Mori survey (2016) run for the #iwill campaign to get more young people involved in social action reported that 43% of young people aged 10-20 were involved in social action in the past year. In our survey, young people aged aged 16 - 18 were more likely to volunteer than those aged 12-15, and female respondents were more likely to volunteer than male respondents. This reflects national trends on age and gender groups. In group discussions, many young people who did not identify as volunteers talked about ways in which they helped people in their communities, such as taking on extra responsibilities in their school or translating for neighbours. Young people also mentioned barriers to volunteering, such as limited access to information on opportunities, age restrictions, the negative attitudes of adults in placements, and the associated costs related to volunteering, such as travel. The proportion of volunteers was higher among young people who felt they belonged in their local neighbourhoods (48%) than among young people who felt that they did not belong (23%). Among the respondents who said that they volunteered regularly (n=265), 90% felt that they belonged in the UK. It appears, therefore, that there is a relationship between young people’s sense of belonging to their local area, and to the UK, and their likelihood of getting involved in social action. Box 1. Profile of survey respondents •	The survey took place between October 2016 and April 2017. In total, 1120 young people completed the survey, with 807 full completions. •	Overall, the survey attracted mainly young people aged 16-18 (68%), while 32% of respondents were aged 12-15. There were more female respondents (60%) than male (38%). The vast majority (97%) identified as White and said they were Christian (59%), while over a third (37%) identified as nonreligious/atheist. •	Over half of the respondents were Polish born (56%), followed by Romanian (10%) and Lithuanian (9%) nationals. The other 25% of our respondents were originally born in other EU and non-EU countries to Eastern European parents. •	Most respondents lived in England (71%) and some in Scotland (19%), while 10% did not give their location. •	Over a third said they had lived in the UK for 10 or more years. Sample criteria: Please note that this was a convenience sample, recruited through schools, youth clubs and social media. The data could not be weighted due to the absence of existing reliable data on EU nationals in the UK. •	All names in this Briefing have been changed to protect the participants. to their local communities than to the UK While 83% of young people said they felt they belonged in the UK, at least ‘a little’, only 14% said they did not have a sense of belonging to the UK. The rest did not know. By comparison, 70% said they felt they belonged to their neighbourhoods - at least ‘sometimes’, while 22% did not feel a sense of belonging to their neighbourhoods, and the rest did not know. This suggests that Eastern European young people living in the UK are more likely to feel a sense of belonging to the UK as a whole than to their neighbourhoods and local communities. Almost a third of respondents (31%) said they ‘sometimes’ felt unsafe in their local areas and over 1 in 3 participants (38%) thought that people living in their areas had some level of prejudice against Eastern Europeans. Schools and neighbourhoods were the most common locations for experiences of discrimination and abuse (see also Briefing No. 1). It is reasonable to assume that those who feel unsafe or unwelcome in their local communities will be less likely to engage with local opportunities. Further research is needed to establish whether this is the case. Young people aged 12-15 were more likely to say they wouldn’t vote (13%) or didn’t know who they would vote for (47%) than 16-18 year-olds (10% and 35%, respectively). Female respondents were more likely to say they would vote Labour and less likely to say they would vote for the Conservative Party or UKIP than male respondents. Young people living in England were more likely to say they were interested in politics that those living in Scotland. In addition, respondents in Scotland were more likely to say that they wouldn’t vote (18%) for than those in England (9%). The voting intentions of those who said they would vote are in Figure 1. •	Young Eastern Europeans are mostly interested in politics, but many have not yet decided which party to support. They need more information to make informed decisions about their voting intentions. •	Young Eastern Europeans are more likely to express a sense of national belonging than a sense of local belonging. Since the Brexit Referendum, many young people report feeling unwelcome in their communities. This impacts negatively on their ability to get involved in volunteering and community social action. •	Young Eastern Europeans think about citizenship mainly in terms of securing British nationality than volunteering and social action. •	There seems to be a strong relationship between young people’s sense of belonging to their communities and the likelihood of them volunteering and getting involved in social action. Based on the project findings, we are making the following recommendations to local authorities and organisations working with young Eastern Europeans and their families. We hope these recommendations will ensure that young people can benefit from services and policies which support them to be active citizens in their communities: •	In light of Brexit, Eastern European young people need immediate clarity about their legal status in the UK, and confirmation of the rights they had as EU nationals migrating under the freedom of movement. •	Citizenship education in schools should emphasise the individual acts of civic participation, as well as the act of gaining citizenship through documentation. It is important to consider that citizenship has additional meanings for young people from a migrant background whose nationality is not British. •	Political education and access to information about politics are key to ensure that CEE-born young people are able to make informed choices. 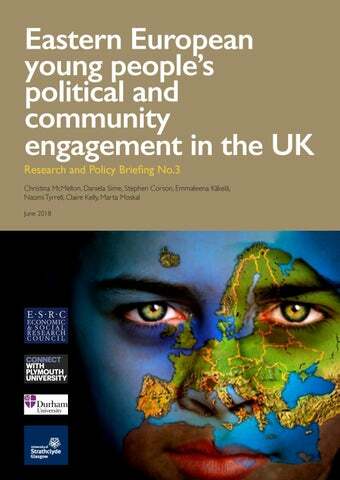 •	CEE-born young people have a stronger sense of belonging to the UK than to their local communities. Services need to support young people to feel more valued and connected and able to play active roles in their neighbourhoods. •	There appears to be an association between the likelihood of young people volunteering in their local communities and their feelings of belonging, suggesting a link between volunteering and community cohesion. Volunteer agencies should, therefore, specifically target young Europeans and consider addressing the specific barriers that may stop this group from volunteering.